Although no-one is sure how many of these rings truly exist or where they now are, they’ve been talked of for millennia. Some say that there were up to twenty of these rings made, while others think three or seven, or even nine. There are whisperings that there is a master ring that enslaves all those who wear the other rings, turning them into demonic servants with terrible powers. Fairy tales no doubt, stories to scare children. But what if the rings really do exist? Who has them now, and what are they going to do with them? While cursed items are included in POLYHEDRAL DUNGEON: Basic Edition, what are supplied is a set of guidelines that doesn’t go into explaining the mechanics of creating or designing cursed items. The rules for creating magic items (which curse items essentially are) are also very simple. This was by design to make the basic version of the game open-ended and flexible for Judges to run. Coming with the release of POLYHEDRAL DUNGEON: The Advanced Rules, POLYHEDRAL DUNGEON: The Book of Magic, and POLYHEDRAL DUNGEON: The Book of Loot are rules to allow the creation of cursed items. POLYHEDRAL DUNGEON got a shout out on episode 101 of the Gaming & BS RPG Podcast. Although mentioned near the end of the podcast, it does come after a great discussion about time constraints on preparing games and running them, and the challenges that come with being a gamer today with commitments getting in the way of gaming. The great news is that POLYHEDRAL DUNGEON was designed in many ways to help with this with it’s low-prep and low overload approach to play. It’s quick to learn, fast to play, but flexible enough to be customized as needed. Thanks for the mention, Brett and Sean! The final version of POLYHEDRAL DUNGEON has been released today. Version 1.4 includes a small number of tweaks to the rule book and a few small tweaks to some Classes and Talents, explained in the included upgrade notes document. Also included in this release is a full single page PDF that lists all of the Talents that individual Classes can have from the Basic Edition (which is also available from this site’s Downloads page). Print proofs of the POD version of the game are being processed right now and will be available soon to order. Anyone who has purchased the Digital version of the game from any sites it is available from will be eligible to get a discount against the OneBookShelf version (or print copies direct from InfiniBadger Press) whenever they chose to upgrade. The mobi and epub ebook versions are in progress too and will be added to all digital bundles as soon as they become available. 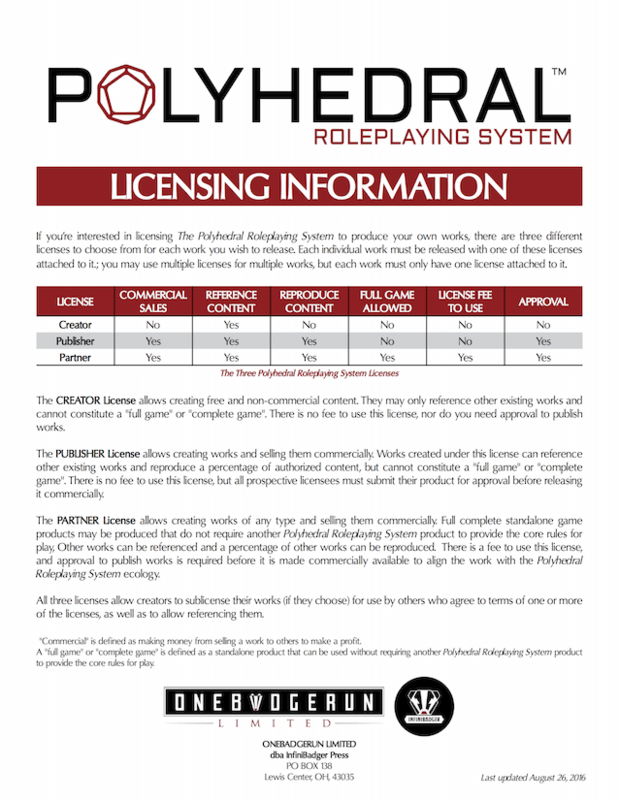 Purchase information for POLYHEDRAL DUNGEON can be found on its dedicated page here. In Soviet Russia, Dungeon Explores You! 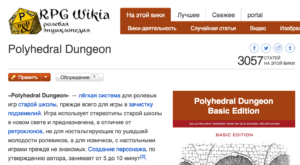 Thanks to +Radaghast Kary, POLYHEDRAL DUNGEON now has an entry on the Russian RPG Wikia! Copies of the game have been purchased by Judges worldwide so far, which is pretty awesome!